DENVER, CO - A new era of basketball has begun in Las Cruces, but New Mexico State men's basketball will keep chugging along full steam ahead according to league coaches and its media as the Aggies were picked to win the Western Athletic Conference in both polls. In the coaches' poll, NM State tallied four first-place votes to Grand Canyon's three to take the top spot by a narrow margin of 45-44. The slim margin was also echoed in the media poll with the Aggies picking up nine first-place votes to GCU's eight gives them a 167-165 edge. CSU Bakersfield took third in both polls while Utah Valley and Seattle U flip flopped spots in each of the polls for fourth and fifth. UMKC, UT Rio Grande Valley and Chicago State rounded out the rest of the polls in the same order. Senior Ian Baker also garnered preseason first-team honors in both the coaches' and media polls. The Aggie floor general averaged 13.8 points and 3.7 assists last season to go with his 4.6 boards per game. He also led the Aggies in scoring four different times and scored 20-plus points five times. The Washington, D.C., native started in all 34 games last season and shot a .425 clip on the year. Baker made headlines on Jan. 23 when he hit the game-winning 3-pointer at CSU Bakersfield in the second overtime period. LAS CRUCES, N.M. – New Mexico State head men's basketball coach Paul Weir unveiled the 2016-17 @AggieArmy schedule on Wednesday that features 17 home games while also returning to the Santa Ana Star Center in Rio Rancho, N.M. to play Northern New Mexico. Aggie fans will get their first look at the team under the direction of the first year head coach at 7:30 p.m. on Nov. 11 at the Pan American Center when NM State entertains Arizona Christian in its home and season opener. LAS CRUCES, N.M. - New Mexico State head men’s basketball coach Paul Weir rounded out his coaching staff with the addition of Marc Hsu on Wednesday. Hsu is very much familiar with Las Cruces, having spent his second year in the collegiate ranks at New Mexico State under legendary head coach Lou Henson as a volunteer director of basketball operations for the 2004-05 season. 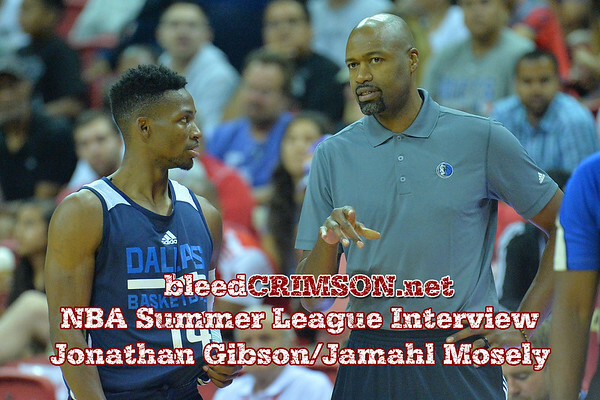 bleedCrimson.net: This is your third time in the NBA Summer League, what’s different for you this year than the previous two? Jonathan Gibson: I feel I have a better opportunity to go out there and show what I can do. Before, my first time I was hurt in Boston and Portland was a tough situation with all those guys under contract. This is really my first real opportunity. bc.net: How has playing overseas helped you prepare for an opportunity like this? LAS CRUCES, N.M. - New Mexico State head men’s basketball coach Paul Weir continues to build his team for the 2016-17 season, landing South Plains College transfer Marlon Jones. Jones, a 6-9 sophomore, earned all-conference honors this past season after averaging 10.8 points and 5.5 rebounds for South Plains. He also shot 57-percent from the floor in Western Junior College Athletic Conference play and 81-percent from the free-throw line. LAS CRUCES, N.M. - Jordan Sperber is set to join the New Mexico State men’s basketball team as the new video coordinator announced head coach Paul Weir on Tuesday. BROOKLYN, N.Y. - Former New Mexico State men’s basketball power forward Pascal Siakam secured his name into Aggie lore on Thursday after being selected in the first round by the Toronto Raptors as the 27th pick overall in the 2016 NBA Draft. LAS CRUCES, N.M. - NM State head men’s basketball coach Paul Weir continues to build his staff, naming Guy Meyer as his director of basketball operations. LAS CRUCES, N.M. - New Mexico State head men’s basketball coach Paul Weir announced the addition of A.J. Harris, a freshman transfer from Ohio State. Harris will sit out the 2016-17 due to the NCAA transfer rule. LAS CRUCES, N.M. - After numerous workouts and discussions with his family, New Mexico State sophomore Pascal Siakam has decided to forgo his remaining eligibility and enter the 2016 NBA Draft. "I think all of us are going to become cheerleaders on June 23rd for Pascal," head coach Paul Weir said. "We are so thankful for everything he did here and are looking forward to following his career,"